I will be contributing to the CASA seminar tonight, given by Robin Morphet, Steven Gray and myself. It will be an update on the NCL – New City Landscape data collected from twitter. The collection of monitored urban areas around the world has now grown to over 60 location. The update focuses on three elements, data pool, temporal activities of cities overal, and networks within the cities. There are also some additional aspects, for examples a view of the first three weeks of the revolution in Egypt as documented earlier focusing on Cairo. 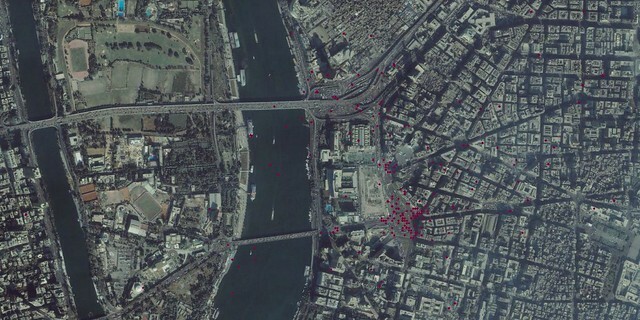 Image by urbanTick / Tweet activity in Cairo around the Tahrir Square in the centre of the city and at the heart of the revolution. This is using Cartographic for the mapping of the data with a bing map in the background. The temporal aspects show variations between the different cities. As a mode of classification a sample of nine cities have been ordered from evening to morning. Some cities seem to be more active in the morning and other in the evening. Dubai and Istanbul for example are clearly more active in the late hours, where on the other end Cairo and Bogota are early birds and tweet a lot more in the morning. The US cities Boston and Atlanta have both a peak in the morning and in the evening. Image by urbanTick for NCL / timeRose diagram of 24 hours – showing twitter activity in percentage of total tweets by hour of the day. Covers the cities Cairo, Bogota, Mexico City, Manila, Atlanta ,Boston Los Angeles, Istanbul, Dubai. Similarly there are preferences regarding the weekdays. Not all areas tweet the same day. The early week days, Monday and Tuesday are generally less active than the rest of the week. Manila clearly prefers the weekend, where Cairo, Istanbul and Mexico City prefer the end of the week, Thursday and Friday. 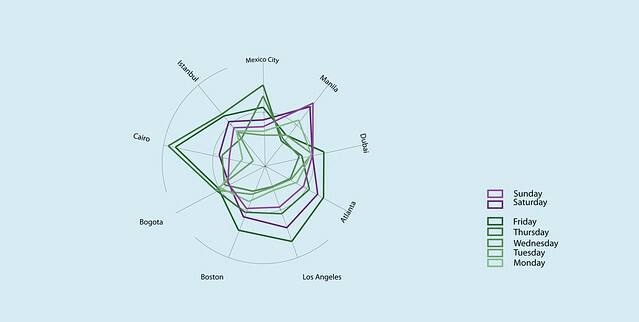 Dubai and especially Bogota have the least differences between the weekdays with very similar numbers of tweets through out the week. Image by urbanTick for NCL / timeRose diagram of the weekdays – showing twitter activity in percentage of total tweets sent by day of the week. Covers the cities Cairo, Bogota, Mexico City, Manila, Atlanta ,Boston Los Angeles, Istanbul, Dubai. As a preview below you find the slides for the talk tonight. Some of the stuff has featured earlier on the blog. So you will ind some background there. You might try the tweetography tag or the twitter tag to dig down. It might involve a bit of scrolling to get to the earlier posts. Anyway if you have time come along tonight for the live update.